The average Briton can make 10 meals from scratch without having to look at a recipe, a survey suggests. 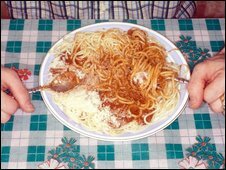 Spaghetti bolognese is the most popular dish, with 65% of people saying they know the recipe by heart. The traditional roast dinner comes in second place with 54% of people able to prepare it unaided. The survey, commissioned by the UKTV Food channel to mark the return of its Market Kitchen show, involved questioning 3,000 people. The survey suggests the average cook is more comfortable preparing foreign dishes than British classics at home. Chilli con carne is the third most popular dish for cooks to attempt, with 42% saying they can manage it without looking at a cookbook or recipe online. Some 41% of cooks feel confident they can prepare the classic Italian dish lasagne. The research defined a recipe as a main course dish containing four or more ingredients. Matthew Fort, presenter of Market Kitchen, said: "The results provide a good snapshot of what Brits are eating week in, week out, because if you cook something regularly enough you will remember the recipe." Those surveyed admitted they made an average of just four home-cooked meals per week. Only 16% of those aged under 25 cook every day compared with 45% of those aged 56 and over. The study revealed British cooks own an average of five recipe books each but are increasingly turning to the internet and television cooking shows for inspiration.